Which IIT is going to organize GATE 2017? IIT Roorkie is going to organize GATE 2017. GATE is organized by IITs/IISC in round robin fashion. As per the link of tender provided below GATE 2017 will be organized by IIT Roorkie and JAM will be organized by IIT Delhi. 1) Candidate must have completed B.E/B.Tech/B.Arch/BPharmfrom a recognized university. 2) Candidate who have completed master’s degree from a recognized university. 3) Candidates who have done B.Sc research/B.S post diploma after 12th can also apply for it. 4) Candidate must have completed integrated M.Sc or five year integrated B.S. – M.S program from a recognized university. 5) Candidates who have done with their qualify examination, all of them they need to submit the degree certificate. 6) Candidate must have completed integrated M.E/M.Tech after B.Sc can also apply for it. Candidates can apply for it via online mode only. Candidates can visit the official site of IISc or IIT’s. From there you have to fill the application form by filling the complete details accurately. After it, upload their category certificate, signatures, photographs and all the mandatory details. GATE 2017 Result– The result will be uploaded in the official website of GATE. You can check out their result from 2nd week of March. Multiple Choice Questions (MCQ)These type of questions will be of total 1 or 2 marks. Each question will have four options and out of them you have to choose the correct. 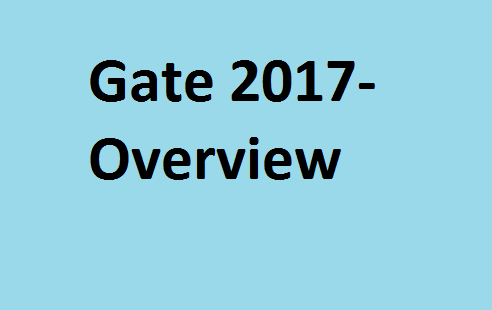 Note– Given details are tentative, final schedule will be updated after release official notice for GATE 2017. Nice details you have shared with us. For gate coaching centers contact us today. Thanks for sharing such a useful post.. I like this article on the exams 2017 it is really beneficial for the students looking for the competitive exams dates. I read your article that one is very good for information so i like your comment and save your link also check that one link. Thanks for sharing such informative content with us. Latest Government & Private Jobs. What is the expected date of JCECE Result 2017? How to Download Admit Card of all exams? Sir CUCET Admit Card 2017 kab release hoga? Great information that you have provided about the application form. This blog always provides the Latest Jobs Updates. Very informative article!!! Keep giving such details.